1. Myth: Dissection is necessary for education in the sciences because it provides students with a “hands-on” approach to learning. Fact: There is no evidence to suggest that dissection is any more hands-on than the use of alternatives. There are many hands-on approaches for learning about animal biology that do not require killing or harming animals, such as the use of three-dimensional plastic models. These models enable students to investigate with greater precision the shape and dimensions of organ structures. Moreover, dissection is not the only way students can learn manual skills. Manual skills can be developed just as well by using plastic models, simulators, and other apparatuses. 2. Myth: Dissection is necessary because it provides students with the most direct access to knowledge about animal physiology and anatomy. Fact: Dissection is often imprecise and inconclusive, and therefore inferior to the use of virtual dissection software. Students may have trouble viewing certain parts of the animal because of errors and other contingencies that may arise during a dissection procedure. Virtual dissection software, on the other hand, enables students to explore animal anatomy and physiology without obstruction and from a variety of perspectives they would not otherwise have access to with an animal cadaver. They can zoom in and zoom out, compare different morphologies on the same screen, benefit from audio and text commentary and instruction, and watch digestive and other physiological procedures in slow motion, among many other things. In virtual dissection programs, students can follow procedures systematically, repeat procedures when needed, and learn functional anatomy interactively. 3. Myth: If you can’t stomach dissection, you’re not cut out to be a scientist. Fact: Since the inception of ‘opt-out’ policies, many biologists have earned advanced degrees without doing animal dissection. Every day more scientists speak out against the reductionist and de-sensitizing culture of life sciences education, and how this limits and distorts scientific knowledge. (You can meet some of these scientists through our poster campaign.) Many ethologists and biologists who oppose invasive studies on animals, such as Jane Goodall, and Canada’s own Anne Dagg, have shown that it is possible to learn about animal behaviour and consciousness through field observation and non-harmful interaction with animals in their natural habitat. These observational field studies are often more accurate than lab studies because labs are highly artificial environments for animals, and because lab animals are forced to engage in behaviours they would not necessarily engage in in a safe and/or natural context. 4. Myth: The use of alternatives is costly and unsustainable. Fact: Mannequins, simulators, models and virtual software can be used repeatedly, while animals must be continually reproduced and purchased to keep up with demand. Non-animal models and approaches allow students to learn by trial and error and to repeat procedures, but without causing the tremendous suffering such practices would normally lead to. In many cases, non-animal models and software can also be used at home, and thereby potentially reduce the impact on university space and faculty resources. 5. 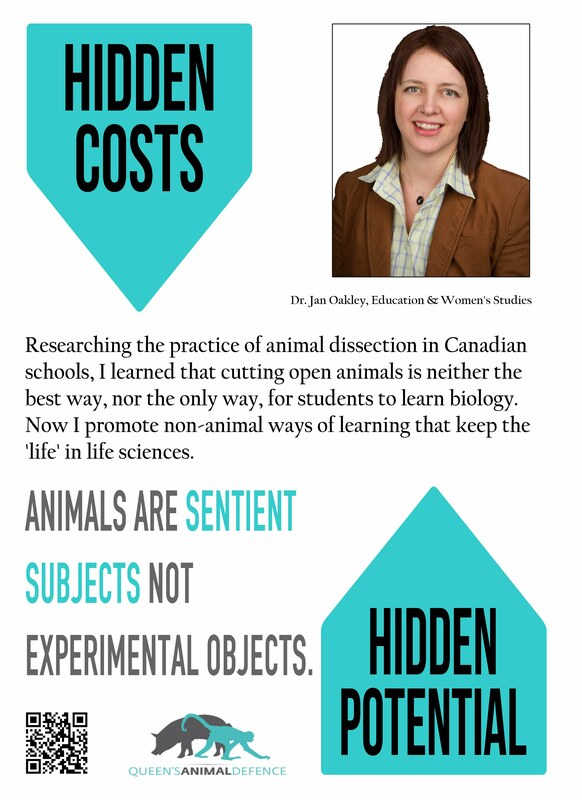 Myth: Students in the sciences are taught to treat animals with respect, but emotions have no place in science. Fact: Students in the sciences are systematically taught to ignore and repress the natural emotional and empathic responses they would otherwise have to witnessing or participating in violence against other sentient beings. Compassion and opposition to harming and killing animals is often reduced to “squeamishness” and “sentimentality,” while indifference and detachment to brutality and suffering are treated as healthy and normal attitudes. This can lead to psychological distress for the students themselves, and can also cultivate a more general attitude of callousness towards other animals and human beings. Education in the sciences should be geared toward teaching students how to respect other animals as individuals with complex emotional, mental, and physical needs and desires, not to torturing and killing them. 6. Myth: Frogs and other amphibians such as salamanders do not feel pain or suffer in live dissections. Fact: They do. “Salamanders are vertebrate animals that are sentient beings (just like mammals), and are fully capable of experiencing pain and suffering.” There are also important environmental and conservation concerns connected to the use of salamanders and amphibians.